It's the nature of myth to re-told, re-cycled, re-imagined into one world after another. Myths are by their nature malleable, stories stripped down to an essence that can be brought to life, a seed that can be planted in the fertile soil of new societies and new imaginations. 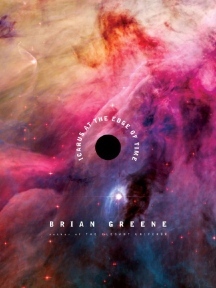 Pulitzer-prize nominee Brian Greene shows just how it should be done with 'Icarus at the Edge of Time', a 34-page board book that brings the Icarus myth into the world of realistic space opera. In fact, this may be one of the more potent and imaginative entries into the space opera sub-genre of science fiction. With fewer words than most writers have on their dust jackets, Greene takes the reader into the future and creates characters we care about whose experience of extrapolated science manage to have real emotional heft. Adding to the delight and the science of the package are images from the Hubble telescope with stunning art direction and design by Chip Kidd. In the near future, humanity gets proof positive of life on Alpha Proxima. A generation ship is sent forth, and Icarus is stuck in the middle. He was born after the ship left earth but will die before it reaches its destination. When the ship needs to change course, Icarus makes a bold decision. Greene uses his words well. There aren't very many, but he does manage to evoke true empathy and emotion for his characters and their situations, as well as discussing some quite interesting scientific theories and playing out their implications in a dramatic manner. The sparse prose is ably complimented by the incredible presentation. Kidd does not inject any CGI tomfoolery into the Hubble images, though he's happy to select and crop them for drama. Don’t go looking for spaceships; you won’t find any here. What you will find is cutting-edge science and killer astrophotography whipped up with clean, crisp, classy graphic design. As a board book, 'Icarus at the Edge of Time' is cleverly designed. You can read it without destroying it. It's sturdy and slick. It's also a new kind of science fiction space opera as well as a new kind of children's book. It really does hold up with an appeal for anyone who is interested in science, storytelling or fathers and sons. That might add up to a sizable audience. They'll be well-rewarded, and it's good that the book can withstand multiple readings. It will get read and re-read; it is, after all, a myth.